← A lot of life and days come down to bad or good timing. Metaskills: Five Talents for the Robotic Age by Marty Neumeier (2013). 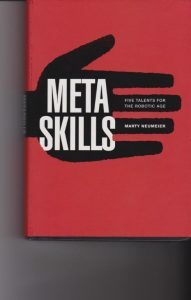 The metaskills explained are feeling, seeing, dreaming, making, and learning. The emphasis is on creativity, design. and learner’s own making skills. The aim is individual success and higher purpose, and deeper fulfillment. The author uses many sources and fuses them to create an approach for more productive education and autonomy. There are many charts, margin summaries, and a fairly impressive source of others’ ideas. Examples are convincing and supportive of his main points. The art is in the framing. Our consciousness is a self-created entertainment for the mind, a magic show that dramatically changes our outlook on life. When we experience content and form through the eyes of our personal associations, we create meaning. Aesthetic choices are never right or wrong, just better or worse. A key characteristic of an inventive mind is a strong disbelief system. The potential of a new idea is often inversely proportional to its comfort factor. The measure of a great idea is the number and quality of the affordances it throws off. Unless you’re willing to get your hands dirty, your imagination will remain unrealized and uninformed. Uncluding is the art of subtracting every element that doesn’t pull its weight, overdecorated. You know you’ve found simplexity when you describe a complicated entity in only a few words, a brief formula, or a clearly conceived diagram. When you enter the joy zone, your learning can be accelerated by a factor of five or ten. When you’re focused on a mission, your mind becomes magnetized. We learn better and faster when we use our senses, our hands, and our whole bodies in addition to our brains. What makes artists different from non-artists is their ability to make subtle distinctions between outcomes. A hands-on, minds-on project can make the difference between shallow and deep learning.